With the help of a good intern, we took the words and ideas from the papers and put them in a spreadsheet. 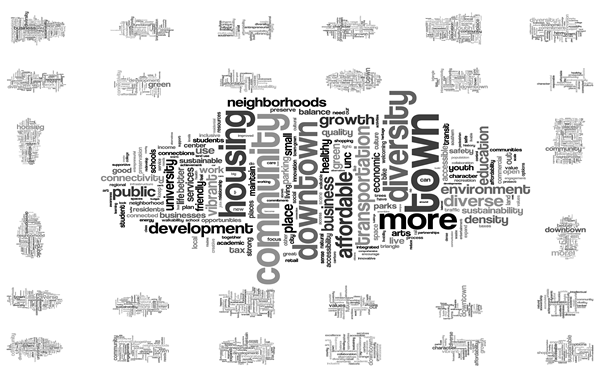 We took that data and used Wordle, a web based tool for generating word clouds, to create this image. Word clouds are used to quickly indicate the most commonly used words in a block of text – the bigger the word, the more frequently it was used. Each table has their own word cloud (the smaller ones). The 200 most frequently recorded words from all tables are in the larger cloud in the center. There are many ways to think about words, ideas, and data. This is just one – what do you think? Word clouds are interesting, but we don’t know if people are describing the way they think it is, or the way they would like it to be (but it isn’t now). You can also generate a word cloud using positive words in a negative way. Take the word “small” does that mean I like it small, I wish it were small, or I wish it weren’t so small. See my point? People will use the language that they have been primed with, using the language that they have heard the most, which is not necessarily the best language to use in a vision statement. The connotations for the word, “diversity,” is mixed and not necessarily positive. It could mean that the townspeople are diverging into different groups, lack cohesion and lack unity. We don’t want to divide, which is why I like the words, “inclusive,” and, “variety,” instead. “Vibrant,” would work well to describe rich urban living prospects, but it won’t work to describe the commercial as vibrant as one might have a Las Vegas image.